Get Ready for the Most Astounding Bird-Flinging, Pig-Smashing Action Ever! The Flock is Back, Baby! The Angry Birds may have won every battle against the Bad Piggies, but the war continues to rage on. Nothing will stop those dastardly porkers in their never-ending quest to eat the ultimate omelette, and they've got a new line of dirty tricks up their sleeves to rob the Flock's nest. If you want to put a stop to their evil schemes once and for all, then prepare to get angrier than you've felt in all your life. If you thought the birds were scary before, you haven't seen anything yet! The Piggies have numbers. The Piggies have machines. The Piggies have forts. The Flock has a slingshot. Fortunately, that's by and large all they've ever needed to teach those greedy egg-nappers a lesson. 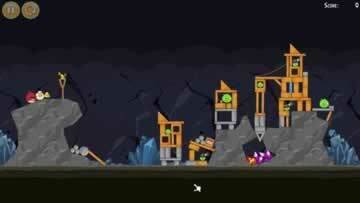 Destroy their structures with extreme prejudice and burning rage! • Complete over 200 challenging pig-smashing levels. • Watch the destruction unfold with all new super-detailed and dynamic visuals. • Fling one bird after another to eliminate every last pig you find. • Cause as much chaos as possible to earn more birds. • Test your skills against the pigs' most powerful bosses. • Pile on the destruction with environmental hazards, including TNT crates, spitting flowers, spinning fans, bottomless pits and more. The family that rages together stays together. Join all the familiar faces of the Flock and use their unique abilities to scorch the earth and roast the pigs! 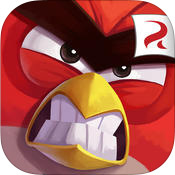 • Use Red the red bird to topple buildings over with a powerful battle cry. • Shatter ice and glass with the Blue Brothers when you split them into three. • Reduce wood to splinters with Chuck the yellow bird and his speedy mid-air dash. • Blow up everything with Bomb the black bird. • Lay an explosive egg in mid-air with Matilda the white bird. • Throw the pigs in for a literal loop with Silver. Are the Bad Piggies proving to be too clever for you? Then show them what for with an arsenal of awesome new spells. • Launch the Golden Duck to rain golden duckies all over the pigs and their creations. • Turn all blocks into easily-shattered pieces of ice with the Freeze spell. • Cook the pigs with a red hot Chili Pepper. In the previous Angry Birds games, you've seen the flock take on the pigs in their world, for the holidays, on the racetrack, in outer space, and even in the universes of Star Wars and Transformers. Now you can experience the next step in the franchise's evolution with Angry Birds 2. With classic gameplay, brand new features, and greater visuals that make it look like you're playing a cartoon, you have what may very well be the biggest, baddest and angriest Angry Birds adventure ever devised. Best of all, you don't need to pay to experience it, for this is one of the first free Angry Birds games you can play. Light your fuse, get into the slingshot, and let the battle commence! The Angry Birds game series has come a long way, spawning over a dozen sequels and spin-offs that put the birds and their porcine enemies into all sorts of crazy adventures. However, Rovio has finally seen fit to make an actual numerical sequel to their insanely popular franchise. It's anyone's guess as to why; calling a game Angry Birds 2 when it has over half a dozen prequels just sounds bizarre. However, that's neither here nor there. The only thing that matters is whether or not it's actually fun. There's good news and there's bad news. The good news is that Angry Birds 2 can indeed be fun. It features the same physics-based destructive gameplay that we all know and love, changes enough things around to feel new, and gives it one heck of a visual facelift that makes it an absolute joy to watch. The bad news is that not all those aforementioned changes are for the better. In fact, a lot of them feel like cynical attempts to squeeze as many dollars out of you as possible. Unlike its predecessors, Angry Birds 2 can be downloaded and played for free in its entirety, but it comes at a cost that may not be worth it. Angry Birds has always boasted a charming art direction. The characters were injected with a lot of personality, the settings were bright and colorful, and the various contraptions that were used were just so delightfully zany. Angry Birds 2 is the culmination of Rovio's visual style. The game no longer looks like a game, it now looks more akin to the series' animated shorts. For one thing, characters display a wider range of emotions that change swiftly and on the fly depending on what's happening on screen. When you pull back on the slingshot, you'll see your loaded bird grit its teeth and growl furiously while the pigs all cower in fear, with panels on either side of the screen showcasing a close-up of both. Things get even crazier once you let go of the sling. The bird will whoop, roar and cackle maniacally, and the pigs will look at all the debris flying around them nervously, sigh in relief if they are spared, or scream in horror when they realize their end is coming. Pigs will even react appropriately if a bird lands harmlessly next to them, usually by looking down at the fiend with annoyance. The level of detail is so astounding that the characters almost seem alive. That's not even getting into how awesome the destruction has gotten. Previous games may have been content in letting the physics do all the work, but not this one. Angry Birds 2 goes through the wringer to make you feel the impact of the chaos you will undoubtedly sow. Pigs fly straight toward the screen when they get caught in particularly powerful blasts, and every TNT crate you burst blows up with a very satisfying boom. It honestly feels like you're playing a cartoon. Angry Birds 2 looks great, there's no way to deny that. It also looks completely familiar to everyone who's played at least one of its predecessors. It's got that same physics-based, building-toppling gameplay we've all been hooked on for years. Most of the old faces are there as well; Red is the jack-of-all-stats who can knock anything down with the help of his battle cry. Chuck has both his trademark airborne speed boost and his effectiveness against wood. Bomb blows everything to smithereens, the blue birds split into three, and so on. 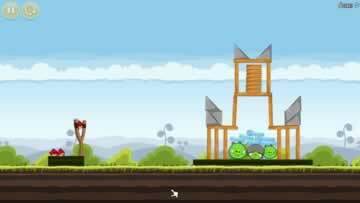 Choosing the right bird for the job is an inherent aspect to Angry Birds' strategy. In fact, that last point marks the first departure that Angry Birds 2 makes to the formula. Previously, you had a specific order to launch the birds. This time, you can choose which bird to load every round. This is a very welcome change that frankly has been long overdue since it gives you more control over how each puzzle can be tackled. Unfortunately, most of the other changes Angry Birds 2 has made are not very good. That isn't necessarily because the mechanics themselves are bad. On the contrary, they may very well have been fun and interesting had this been a typical Angry Birds title. The problem is that this isn't a typical Angry Birds title; this is a freemium game with a different business model, and it's evident that these new features were not implemented for the sake of fun, but for the sake of profit. Limited lives are the most notable of these alterations. Gone are the days of the free reloads. When you've expended all your birds or feel the need to restart, you now have to sacrifice a life. Lose all five lives, and you have to wait for them to replenish, buy more with gems, or watch an advertisement. It may seem reasonable for the first couple dozen easy levels, but in true Angry Birds fashion, the difficulty will ratchet up. It really doesn't help when the game is so unfair and seems to be doing everything it can to mess you up with its other new "features." The first of these is the division of each level into separate "rooms." Each room contains a different arrangement of forts to topple and pigs to crush, with no restocking of angry bird ammunition in between. If you use up all your birds before the level is complete, then you lose a life and get booted back to the beginning. The number of birds you have on hand is also more limited than it was in the past. You can get more mid-level by causing enough destruction, but what kind of bird you get is randomized. This of course means that you may very well get stuck with birds that won't match the type of obstructions you're dealing with. That leads into the last issue. Luck plays an even bigger role in Angry Birds 2 than it did in the past. Originally, you were only at the mercy of the not-entirely-predictable physics. Now you have to deal with unpredictable physics, a randomized bird arsenal, and slightly randomized fortresses to topple. With so much down to chance, not only has a lot of the inherent strategy for Angry Birds been lost, but it leaves a bad taste when you realize how much money and time the app is trying to squeeze out of you. It's kind of painful to see the state of Angry Birds 2. The series has always been amazingly fun and addictive, but this entry is just too restrictive with its limited lives and abuse of the random number generator. The sad thing is that there is a legitimately fun game underneath it all; if it wasn't trying to nickel-and-dime you, it would have been a decent title. It probably wouldn't have been the best Angry Birds game, but it would have been a good one. By all means, check it out if you can't get enough of those ill-tempered avians. If you're patient and/or willing to spend some money, you might enjoy yourself. However, if you want a good deal, you're better off just buying one of the earlier titles.